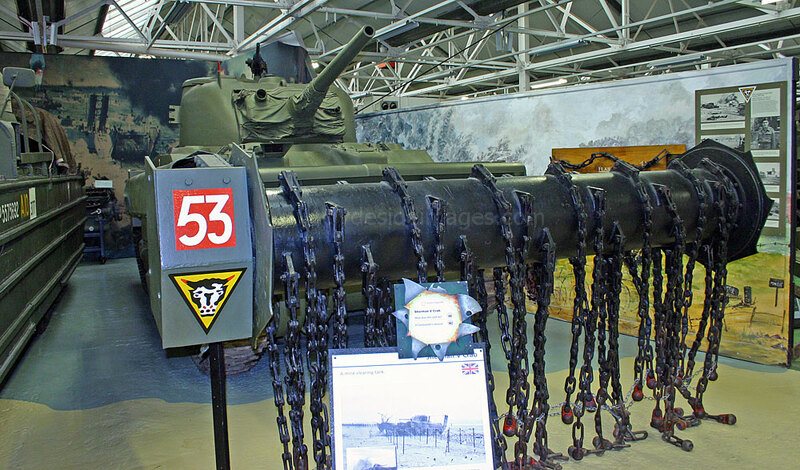 A Sherman Crab, Part of the Tank Museum`s collection, Bovington, England. 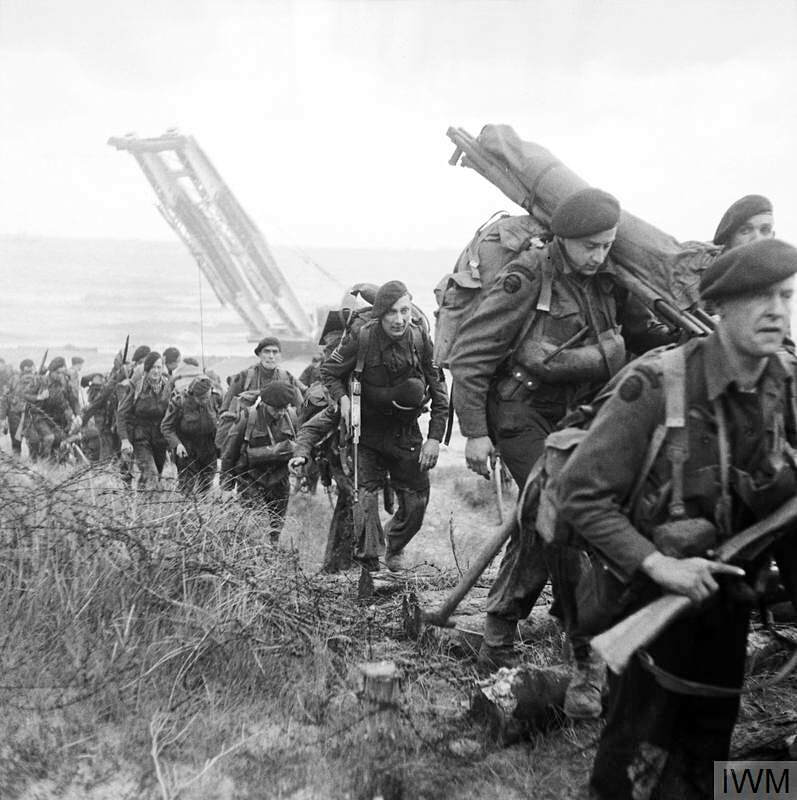 After the disastrous Dieppe Raid of 1942, Allied commanders realised that new tactics and equipment would have to be developed to provide the infantry with armour support and a means to overcome beach obstacles and coastal defences. This was an essential component if another mass amphibious landing on the shores of Occupied Europe had any hope of success. 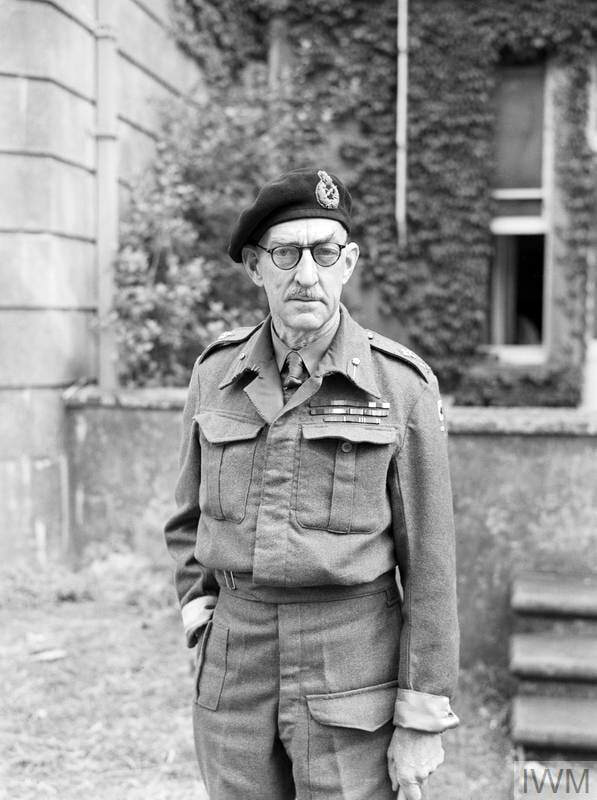 British armoured warfare expert Major General Percy Hobart was tasked with adapting Churchill and Sherman tanks to perform various roles, many of which were already in use or in development. For example, during the North African campaign British Matildas had been converted into flail tanks to clear paths through German minefields, and the Red Army had T-34 roller-equipped tanks performing the same function. Bridgelayers and fascine carriers were also in use but the ‘Funnies’ became the largest and most elaborate collection of military engineering vehicles assembled during the war. By early 1944, Hobart was ready to demonstrate his ‘menagerie’ to Eisenhower and Montgomery, showing them what each type of tank was capable of. 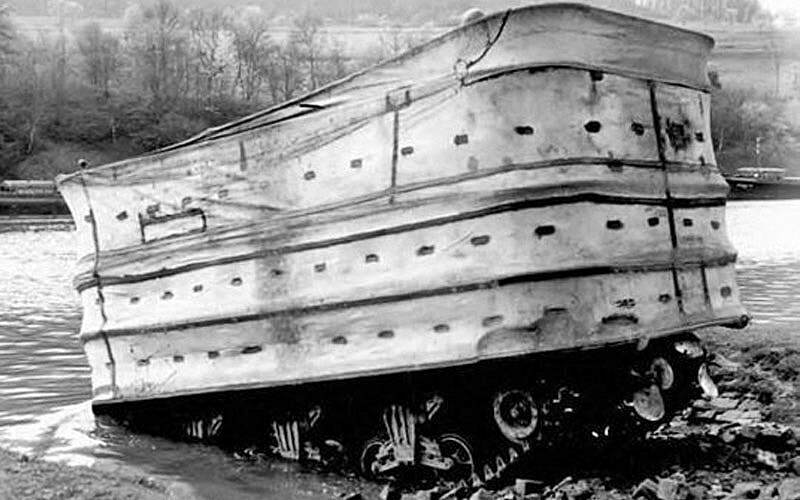 The creations included swimming Duplex Drive tanks surrounded by a high watertight canvas screen to prevent them being flooded, Crab mine clearers with chain flails, and AVRE engineer tanks along with Crocodile flame-throwers. A third of the modified tanks were offered to the Americans to support their landings, but General Omar Bradley appeared sceptical as to their value and only accepted a relatively small number of Duplex Drive Shermans. After the mauling the US troops received at OMAHA, many criticised this decision and felt that additional tanks, in a variety of roles, would have proved invaluable and would likely have saved at least some American lives. Early British experiments with Swimming Tanks: The above shot shows a Valentine tank being launched at sea in calm waters. Swimming Tanks were actually invented by brilliant Hungarian engineer, Nicholas Straussler, who realised that with adequate displacement even a 30 ton armoured vehicle can be made to float. 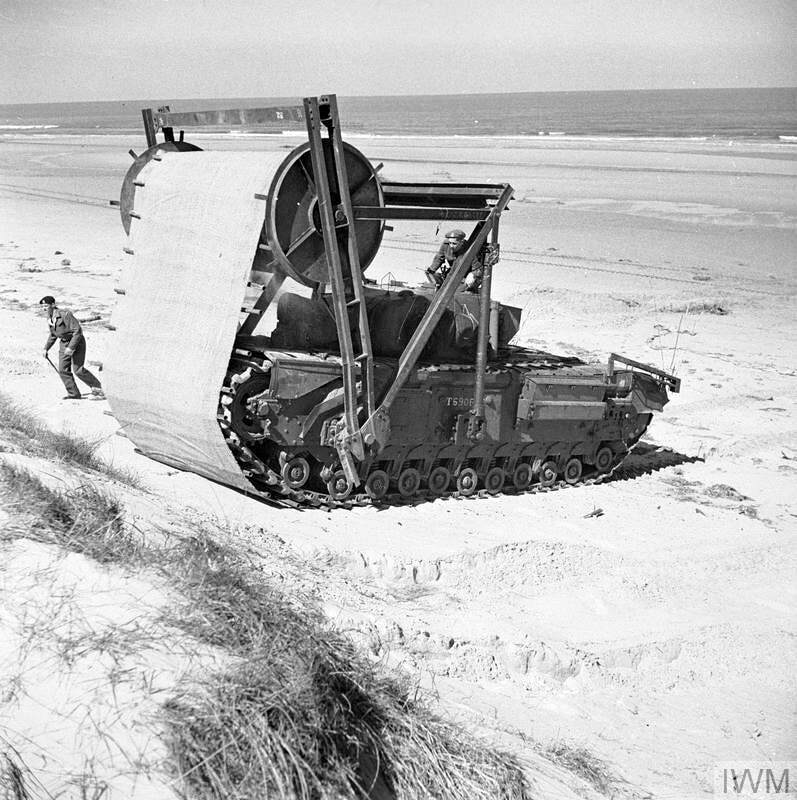 He proved the point by fitting an inflatable canvas skirt and propellers which were used to enable the tank to swim ashore under its own power before transferring the drive back to its tracks. 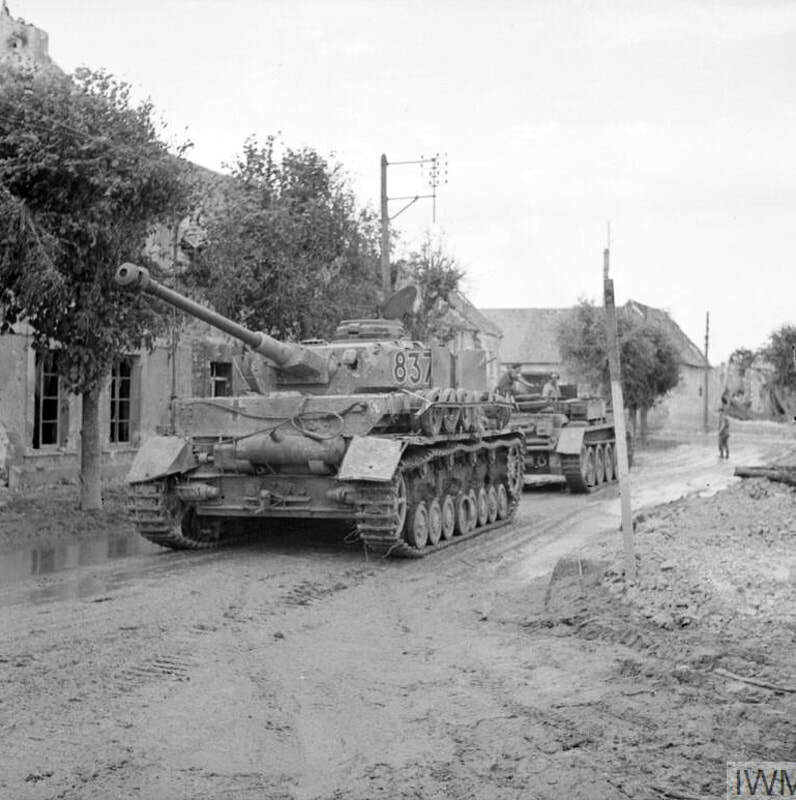 Demonstrations in England before D-Day: A DD (Duplex-Drive Sherman above and, right, a Churchill Bridge-layer ready to cross an anti-tank ditch after a Fascine-carrier has laid bundles on the far side to reduce the drop. Below: Armour on D-Day. 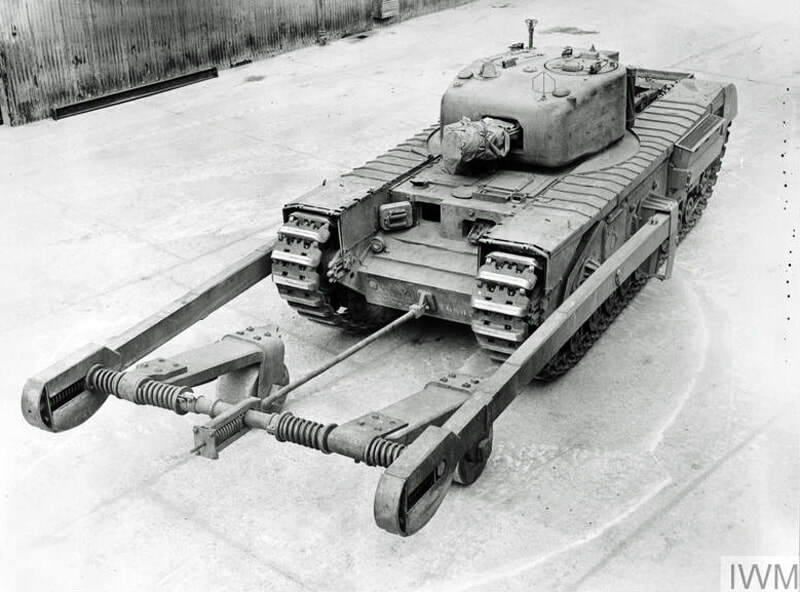 ​Many of Hobart’s designs were modified forms of the Churchill tank which may have been a factor in Bradley’s reluctance to use them as his troops were unfamiliar with the type. 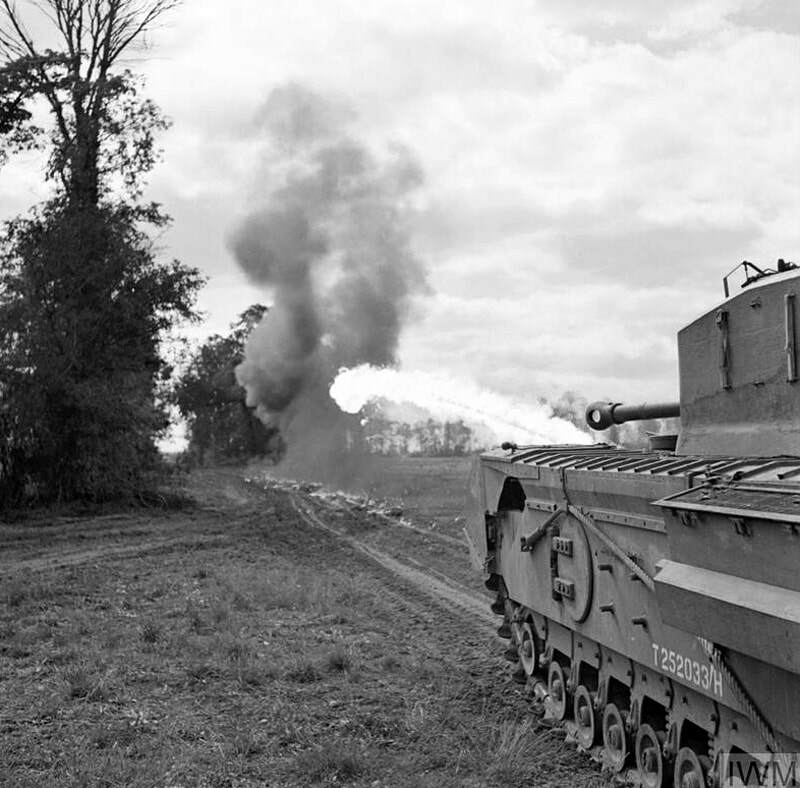 ​Modified Churchills included the flame-throwing Crocodile which proved highly effective at clearing bunkers, trenches and other enemy strongpoints. 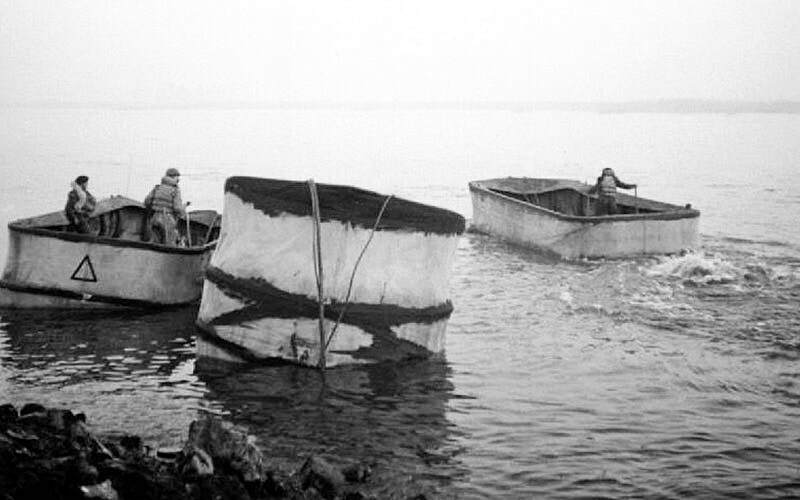 After D-Day, US forces did make limited use of the Sherman Crab mine-clearers. 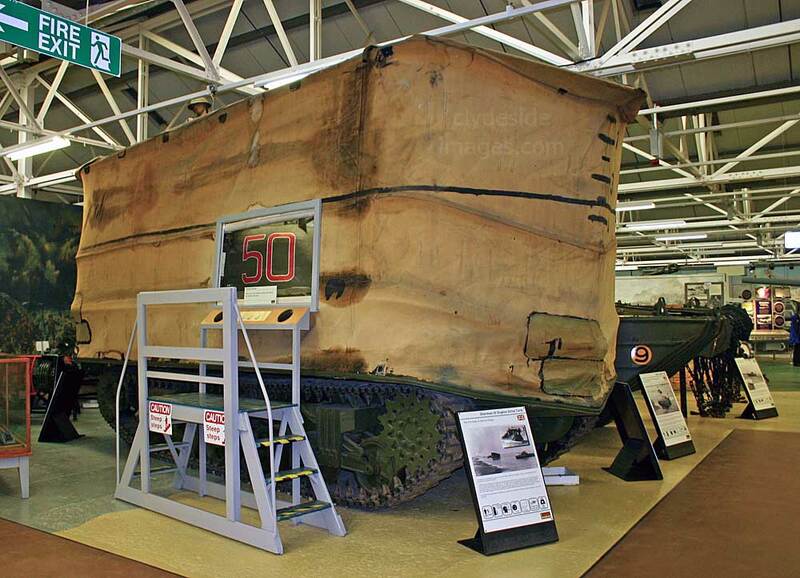 This Duplex Drive tank with screen deployed is on show at the Tank Museum, Bovington, Dorset. 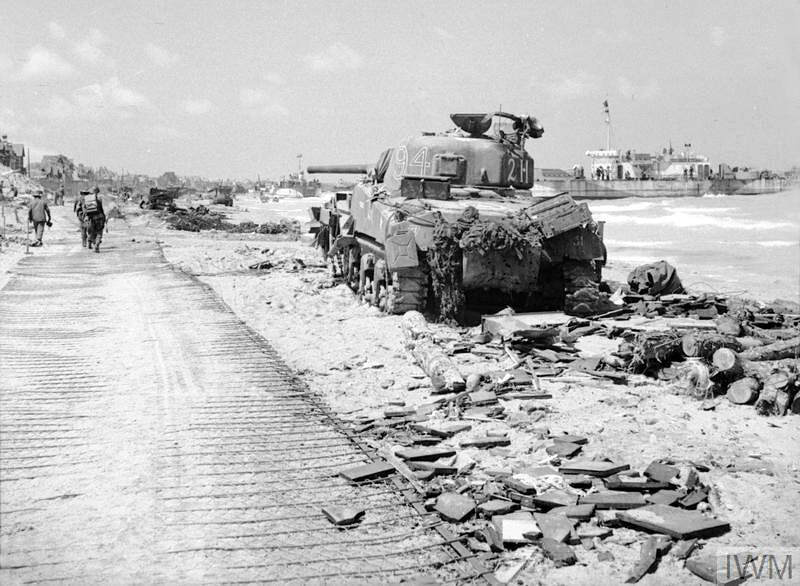 Below right: A disabled Sherman Crab flail tank (turret number '94') of the 22nd Dragoons, 79th Armoured Division, lies abandoned on Queen White beach, SWORD area on 7 June 1944. 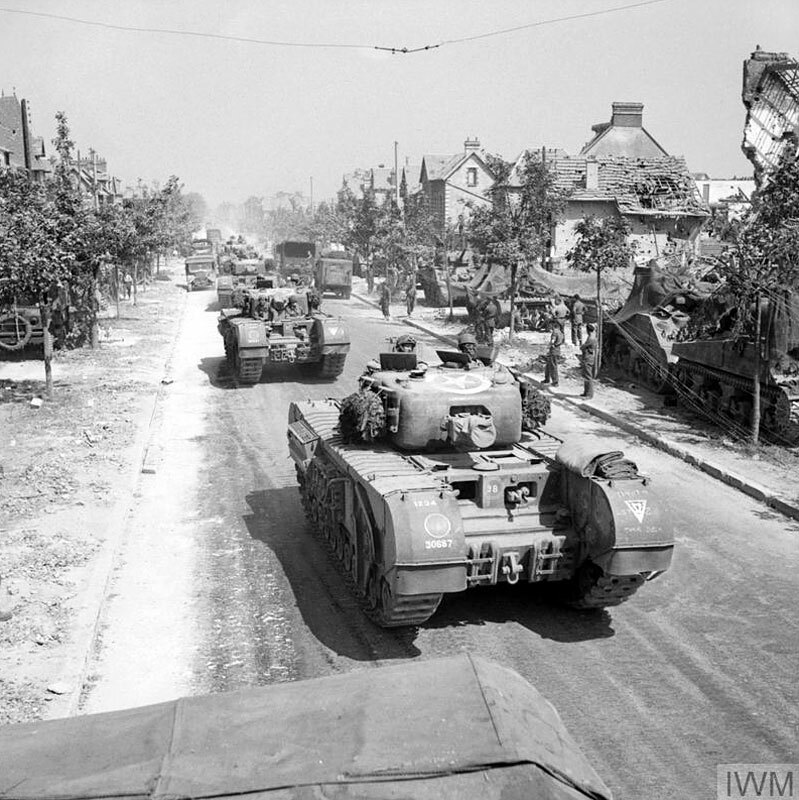 ​Above left: Sherman DD tanks of 'B' Squadron, 13th/18th Royal Hussars support infantry of the 2nd East Yorkshires and commandos of No. 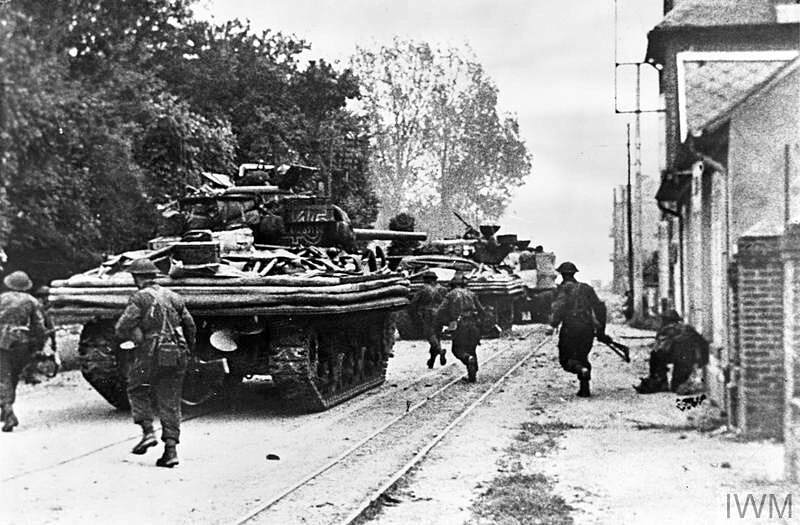 4 Commando, 1st Special Service Brigade, as they advance into Ouistreham along the Route de Lion on 6 June 1944. 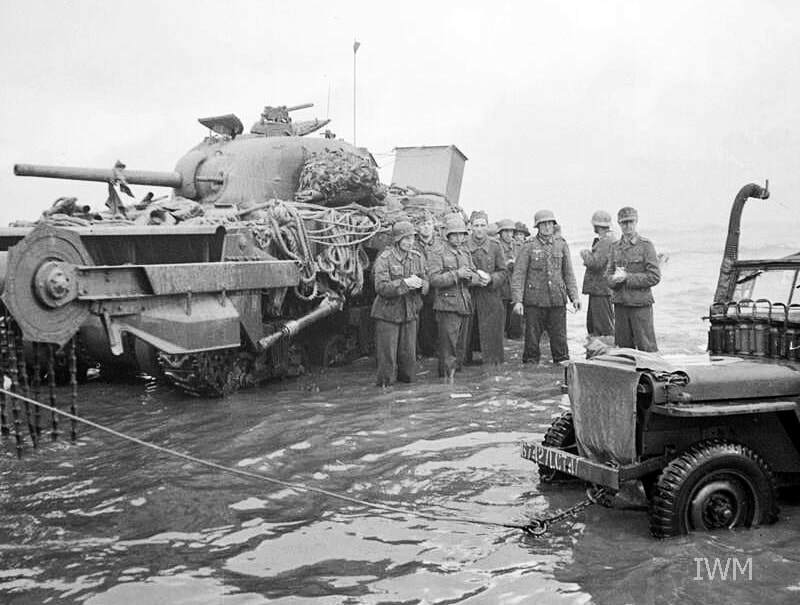 ​The following shots show a Sherman DD with its waterproof screen folded down and a Crab flail in action. Note its turret has been reversed as the mine-clearer advances to protect the main gun from blast damage. Above right: German POWs under supervision are put to work shifting stranded vehicles, in this case a Jeep, on one of the British D-Day beaches. A knocked out Sherman Crab is alongside. 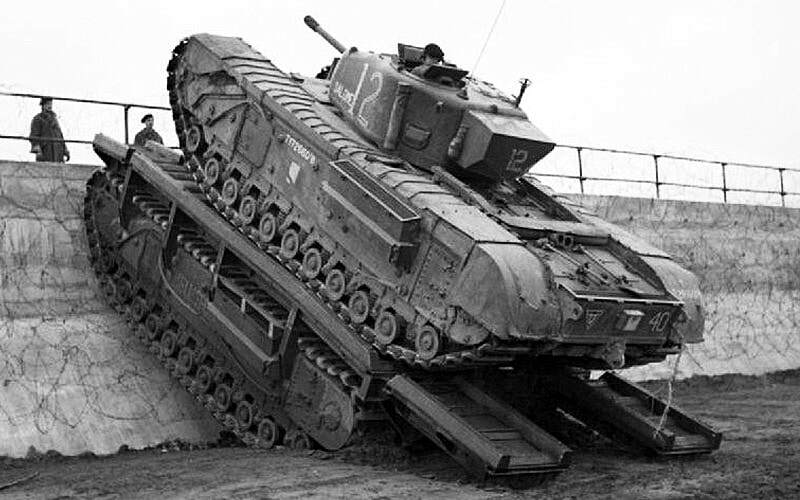 The other image shows a Churchill climbing up and over a turretless bridging hull laid against a steep sea wall in training. 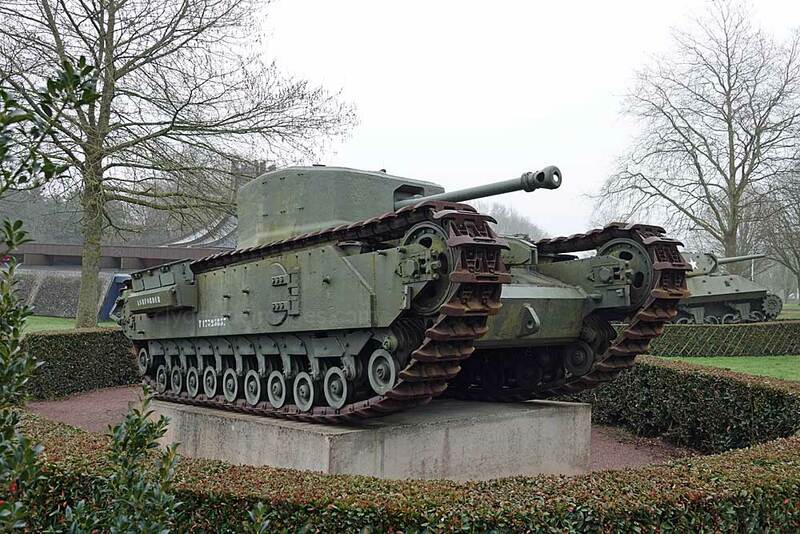 This Churchill Crocodile, `Ashforder` minus trailer, is on display outside the Bayeux Museum of the Battle of Normandy. 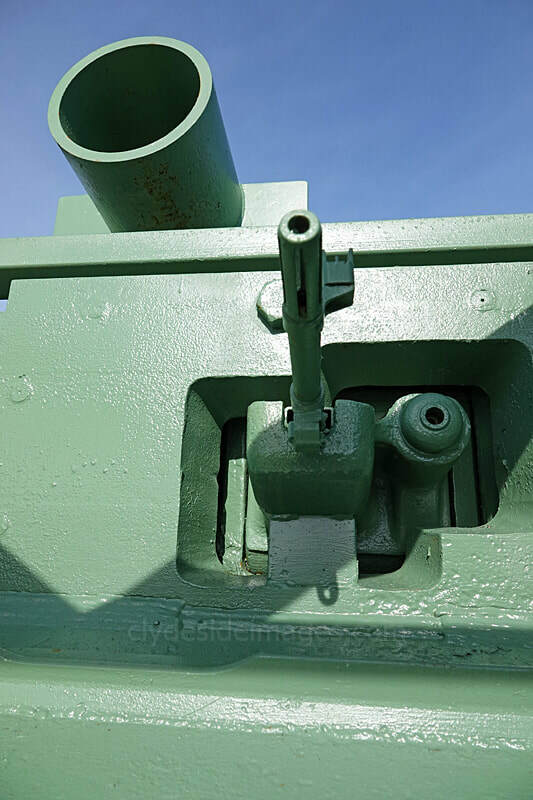 Other surviving Crocodiles, one in running order, can be found at several locations in the UK, the Kubinka Tank Museum in Russia and the Museum of the Regiments, Calgary, Alberta. A Mark VIII is displayed at the Royal Australian Armoured Corps Museum. 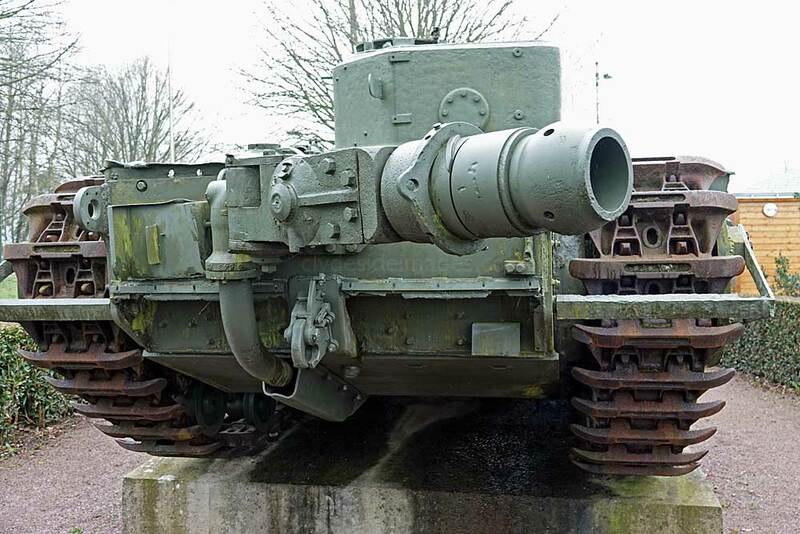 Another example can be found in Brest, France where they were used in September 1944. The AVREs were manned by a crew of six, all of whom came from the Royal Engineers, apart from the driver who was selected from the Royal Armoured Corps. 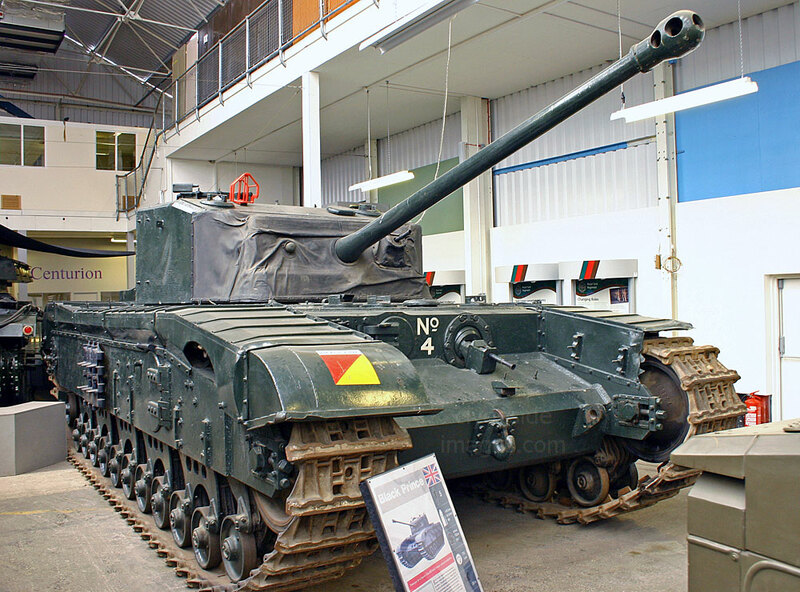 The collection at The Tank Museum, Bovington includes a working Mark III Churchill AVRE and this example is permanently on display alongside the memorial to No. 41 Royal Marine Commando at Lion-sur-Mer, Normandy. 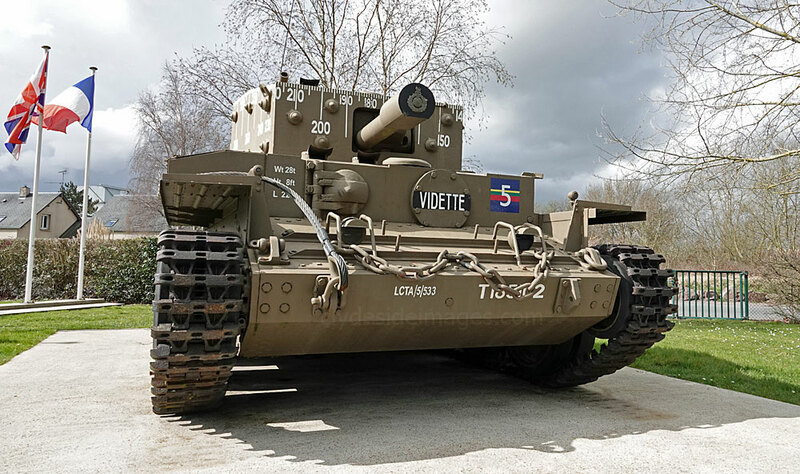 Another preserved Churchill AVRE petard-equipped tank, named ‘1 Charlie’ now stands on JUNO Beach, close to the junction of Green (left) and Red (right) sectors of MIKE Beach where the Royal Winnipeg Rifles landed on 6th June 1944 accompanied by elements of the Canadian Armoured Regiment. The Winnipegs were to suffer 128 casualties which was the second highest of all Canadian regimental casualties on D-Day. More information on the battle for JUNO Beach and this tank`s involvement can be viewed here. 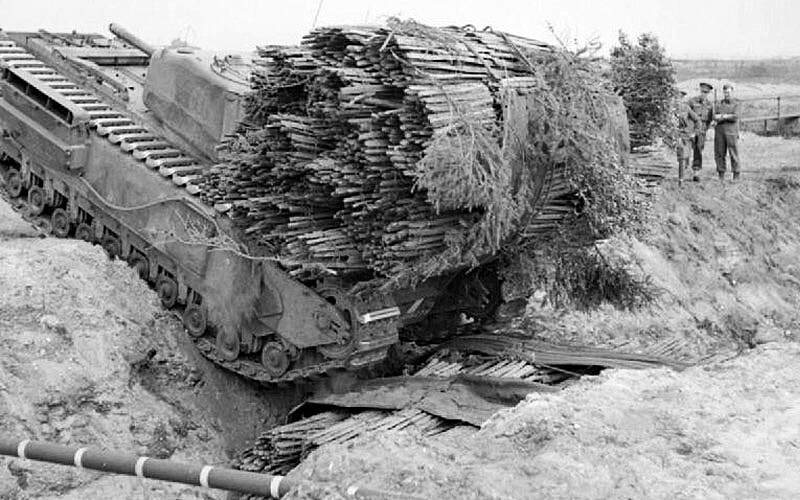 It wasn`t just Shermans that were designed to clear passages through minefields - Churchill AVREs were also equipped with mine clearing equipment. 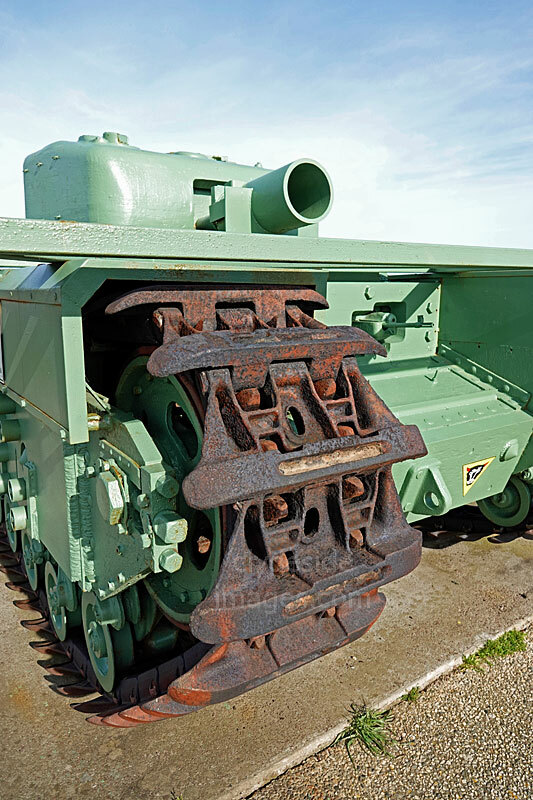 The British produced the Anti Mine Roller Attachment (AMRA) for their Matilda II, Valentine, and Crusader tanks in the Western Desert but the rollers only covered the width of each track rather than clearing a full `tank-width` path for follow-on vehicles and troops. The `Canadian Indestructible Roller Device` (CIRD) (above right) was developed to detect the presence of minefields, then mine flails would move in and clear the route. The adjacent image shows a Churchill-Fascine layer demonstrating its abilities. 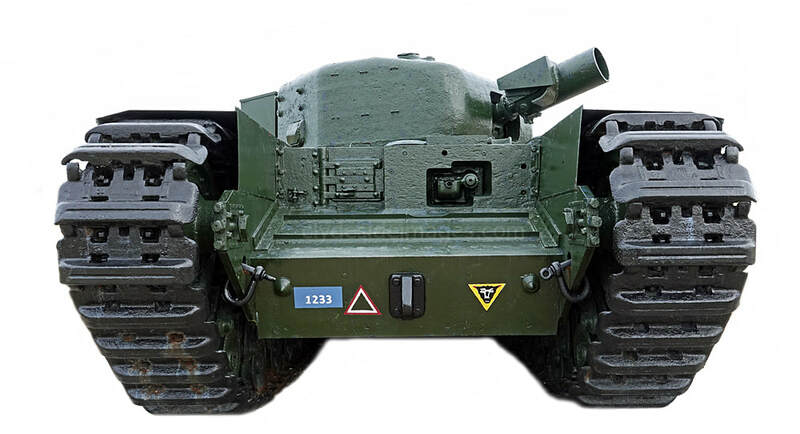 This is a Centaur A27M tank, known as the Centaur IV. The type is based on the British Army Cromwell. 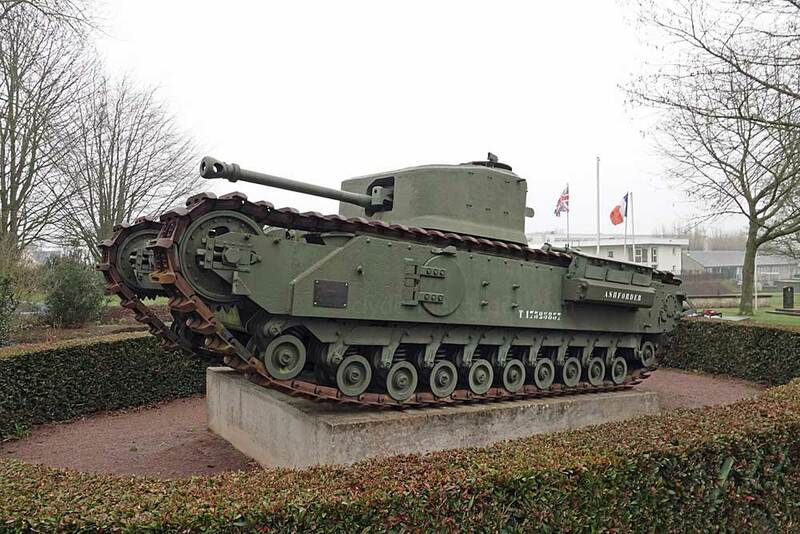 This machine, `Vidette`, landed at la Breche d’Hermanville but was knocked-out soon after and following its recovery in November 1975, it was brought to the Orne and originally placed close to Pegasus Bridge before eventually being moved into the grounds of the Pegasus Memorial museum. 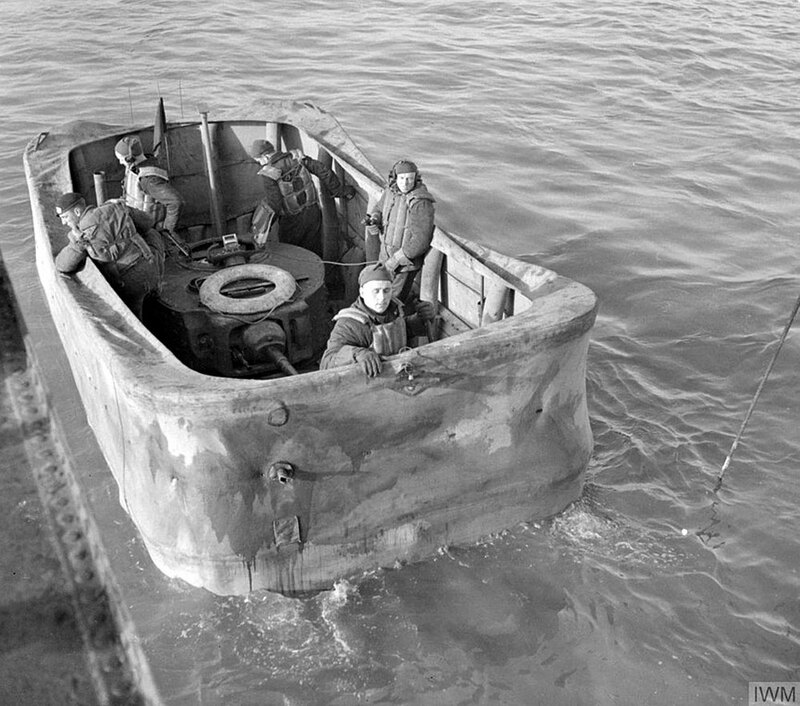 The large bearing marks on the outside of the turret enabled the crew to fire on coastal targets directly from a landing craft while heading into shore, even in relatively choppy seas. 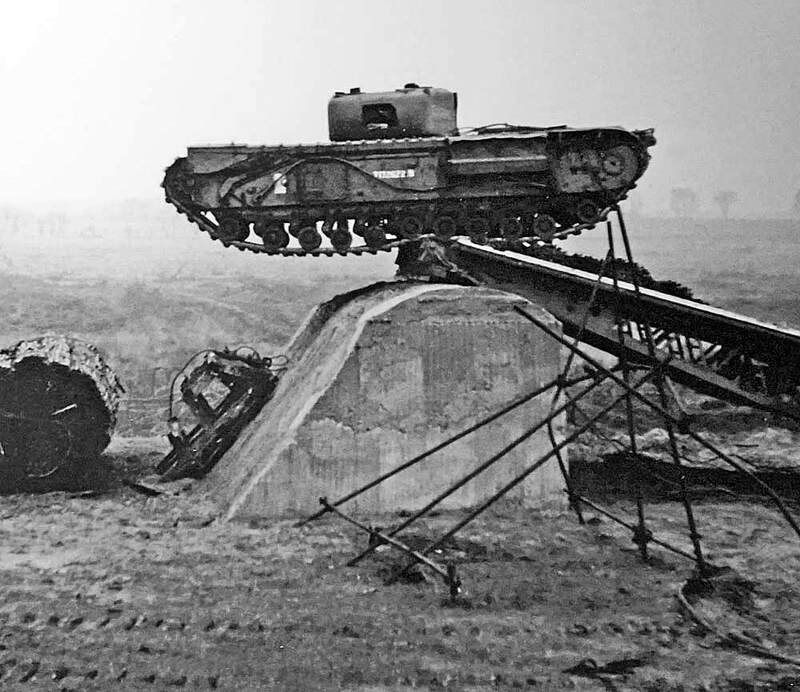 The Small Box Girder was a tracked assault bridge that could be dropped to span a 30-foot (9.1m) gap in 30 seconds, while the ARK (Armoured Ramp Carrier), also based on a Churchill hull, had no turret but extendable ramps at each end. 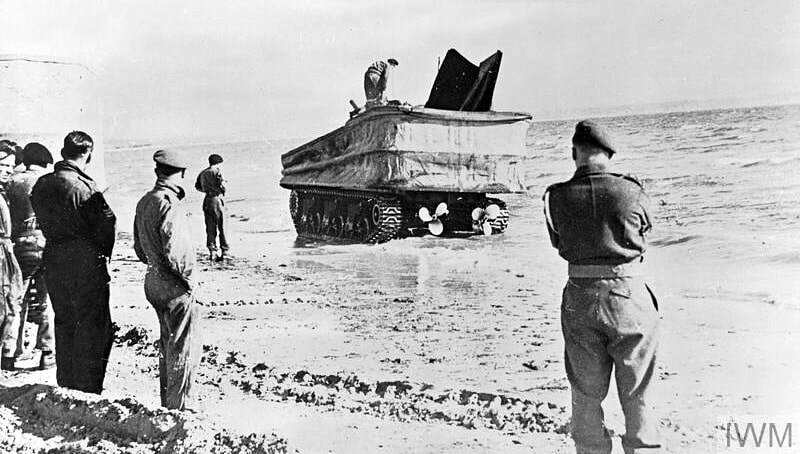 The ARK could position itself in a depression such as a wide ditch, enabling other vehicles to negotiate the obstacle by driving up and over the ‘Funny’. 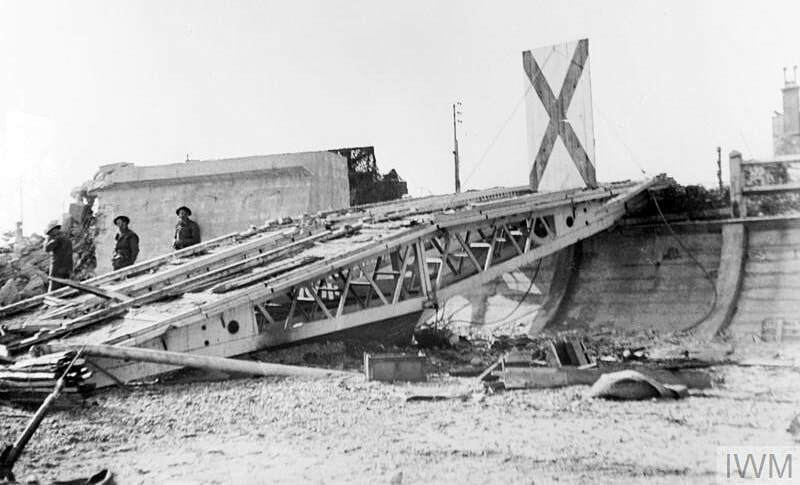 The bridge below had been laid by a modified Churchill to negotiate the seawall at JUNO Beach on D-Day. 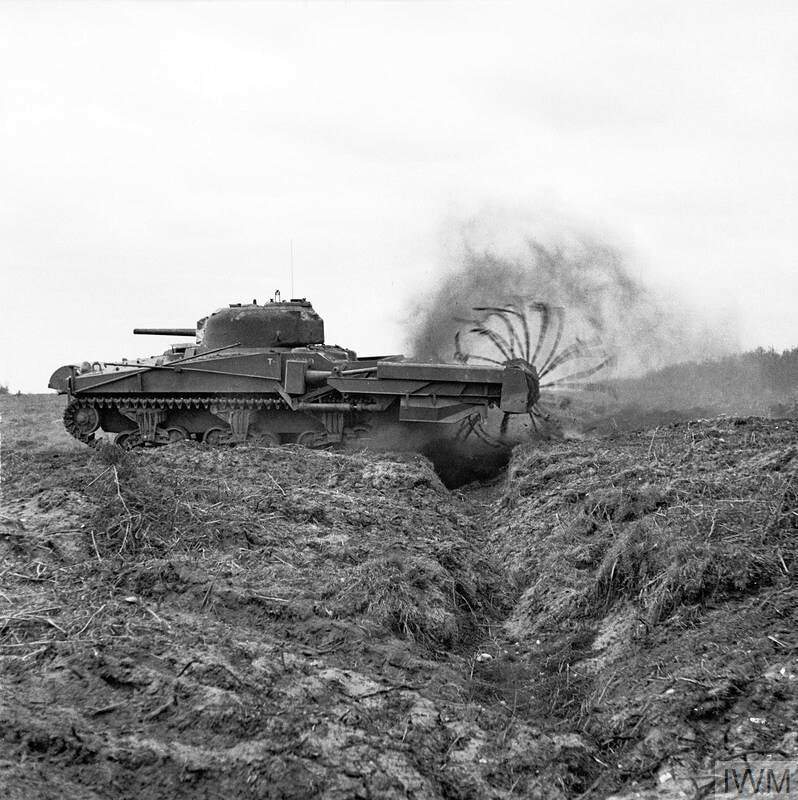 ​Churchills and Shermans also served as heavy demolition charge-layers, armoured bulldozers and armoured ploughs, and there were other purpose-built tracked vehicles such as the amphibious infantry landing and cargo carrying vehicles known as ‘Buffalos’. ​Please bear in mind that all images on this website are Copyright. They are not free to use and have been embedded with a digital watermark. Any historic photographs from the Imperial War Museum and other organisations` archives have been used courtesy of a `Share & Reuse` policy and are also subject to copyright restrictions, or are in the public domain. 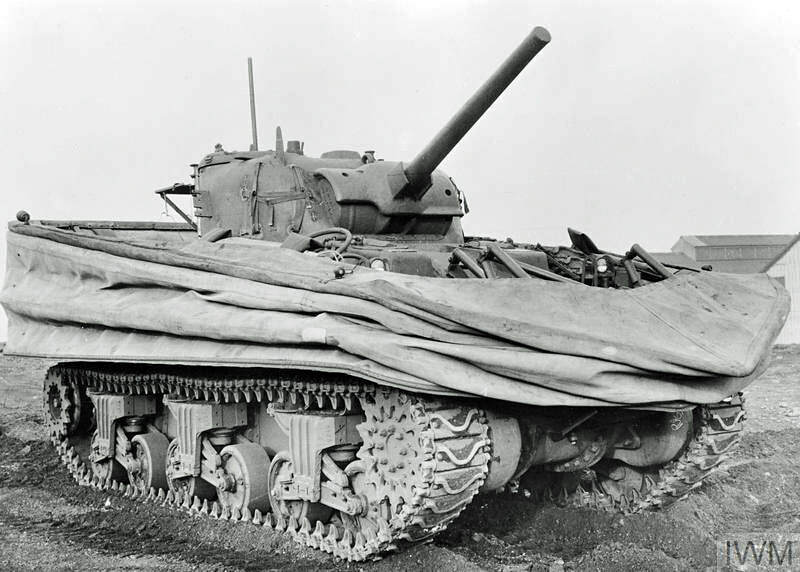 Some AVREs were adapted to carry a reel of 10-foot (3 metre) wide canvas cloth reinforced with steel poles which could be unrolled onto soft sand to form a path capable of supporting follow-on tanks and vehicles. This version was named ‘Bobbin’. The Fascine carried a bundle of wooden poles or rough brushwood lashed together with wires that could be released to fill a ditch, or form a step to negotiate a sea wall. Metal pipes in the centre of the fascine allowed water to flow through and drain. 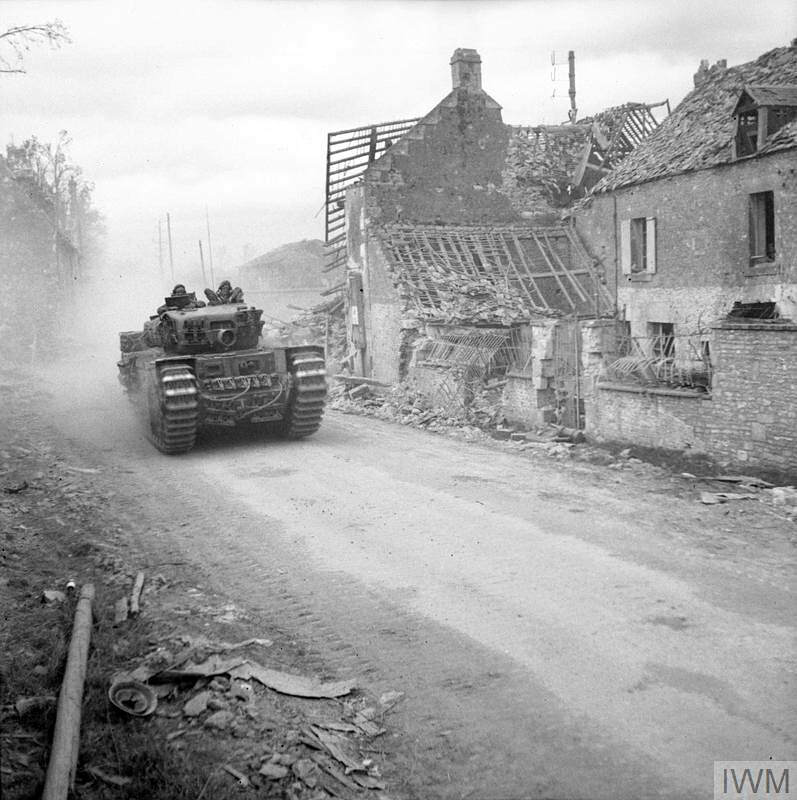 Above: Practice with a Churchill carpet-layer prior to the Landings and, on the right, a Cromwell Armoured Recovery Vehicle (ARV) towing a captured German PzKpfw IV tank during the Normandy Campaign. While the tank pictured below, The Black Prince, was not one of Hobart`s `Funnies` and didn`t see service in the war, I`ve included it here as it was a development of the Churchill Tank. It was designed to carry a more powerful gun than a conventional Churchill and the hull was widened to accommodate a larger turret. The Black Prince weighed around ten tons more than the Churchill so the suspension was modified and the tracks widened by 10 inches to carry the extra load. The Churchill's 350-horsepower (260 kW) engine was retained, however, but this left the new tank drastically underpowered and slow with maximum speeds 10.5 mph (16.9 km/h) on roads and 7.5 mph (12.1 km/h) cross country. 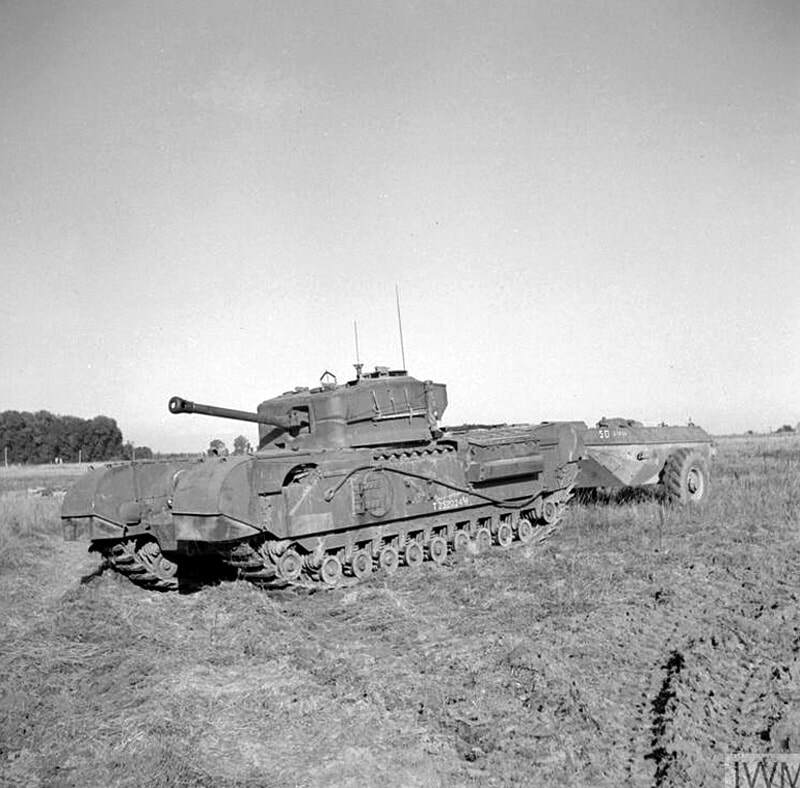 By the time the Black Prince prototypes had appeared in May 1945, the Sherman Firefly had proved itself in combat, the Comet tank was in service and the introduction of the Centurion was imminent. All these tanks carried the effective QF 17-pounder or similar, and all had better characteristics, so the development project was abandoned. The Black Prince at Bovington is the only one of its kind in the world. 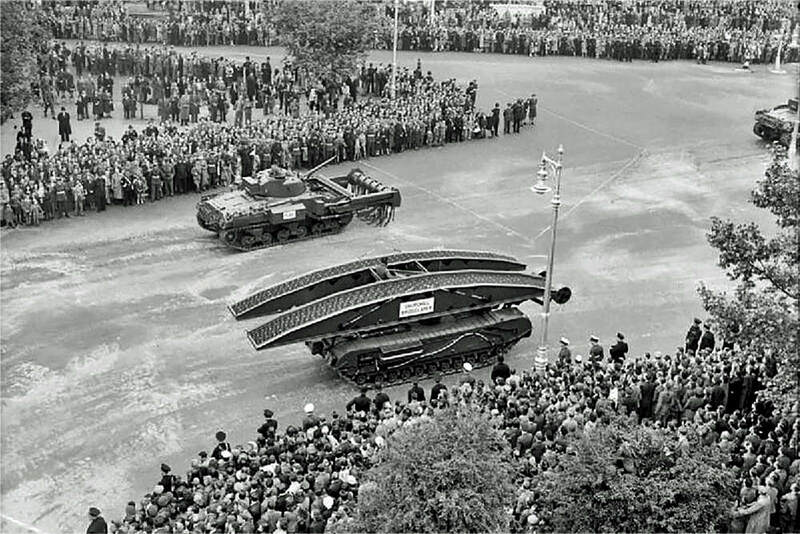 This Sherman Crab Flail-tank and Churchill Bridge-layer took part in the 1946 Victory Parade in London.